Do It Yourself or Hire a Consultant? It can feel like there’s more consultants trying to sell you than there are potato chips on the grocery aisle. Hiring a consultant can be a costly, negative, regrettable experience… or a powerful, enjoyable breath of fresh air. Success is dependent on the consultants’ ability to solve YOUR problems and to do so by involving staff, teaching them new skills and techniques, and mentoring them. identify revenue generating opportunities aligned with your business and strategic plans. Before a project begins, I work with your team to ensure everyone is prepared to do their piece. Together we create communications plans to ensure transparency, identify assumptions, risks, and mitigation options for them, and when needed, I work with your team to implement a formal, Prosci® based change management plan. The result is an engaged workforce all pulling together to make each project a success, projects that are done on time, within budget, and create value. Helping departments help each other. Businesses demand staff with many different skills sets. Because of those differences, conflicts can arise and communication suffers. I work with your departments to develop open lines of communication and understand how helping one another helps each of them individually and as a company. The result is less infighting and finger pointing, more efficient and productive employees, better morale and happier customers. Selling to the right customers. No business can provide everything to everybody. I’ll help your executive team zero in on their ideal target market and help everyone involved in sales and marketing quickly weed out the bad prospects and focus on the right ones. Suddenly your business won’t feel stretched to do things for clients that consume time and resources. You’ll have time to take care of the good clients and staff will feel relieved to be doing good work that is appreciated. Growth means change, and change is tough. I help your employees identify and understand the impacts of rapid growth so they’re prepared and can see the benefits. Some of your staff will yearn for the good old days and they will decide to go. The rest will see the benefits and embrace the new normal. Your business will begin to realize its potential and you’ll remember why you got into business in the first place. I am Committed to success. I will do everything in my power to help you solve your issues. If I can’t help bring about the success you want, you shouldn’t be working with me. It’s as simple as that. I depend on Teamwork. While I bring decades of experience, solutions and prior success to your business, I can’t fix your problems by myself – it takes teamwork. You and your team must be a part of the solutions or they won’t work and they won’t last. I won’t do your work for you; I will help you identify solutions and implement them and I’ll be there with you every step of the way until you don’t need me anymore. I am constantly Learning. I have a voracious appetite for knowledge and love to share the insights I’ve gained from others. Sharing knowledge is how we learn and grow. I’ll make sure your executive team gets its fill of new insights and tools and knows how to use them. I value Honesty. Telling someone the truth can be difficult. If you’re not interested in the truth, I’m not your guy. If you want someone who isn’t afraid to speak the truth, no matter how good or bad that truth may be, I am your guy. And I won’t stop there. I’ll make sure you understand all the good, and the bad, that you may be facing…and are prepared for it. I operate with Integrity. I began working on an ethics program with a national consulting organization twenty years ago. I teach businesses about business ethics; what they mean, how to implement them, and how they can make their businesses better. Every proposal includes our personal Code of Ethics. Click the link to see it or send me an email and I’ll forward a copy to you. I always strive to have Fun. While I expect to make a profit from our work, I don’t work for profits. I work because I love helping businesses avoid unwitting self-inflicted problems, problems that are easy to correct… and avoid. I love my clients and have developed many multi-year relationships with them. Sometimes the work is difficult. Remember, every house has a bathroom that needs to be cleaned and I don’t know anyone who enjoys doing that work. I have fun working together with my clients. You have a need and want some help. You have an idea about what’s wrong and how to fix it, but you live in the forest and occasionally have a hard time seeing anything but the trees. I begin by listening to you explain your situation and sharing your evidence. Then we talk about symptoms and core causes until we find exactly what’s going on in your business. There are only three things a business needs to achieve to be successful. 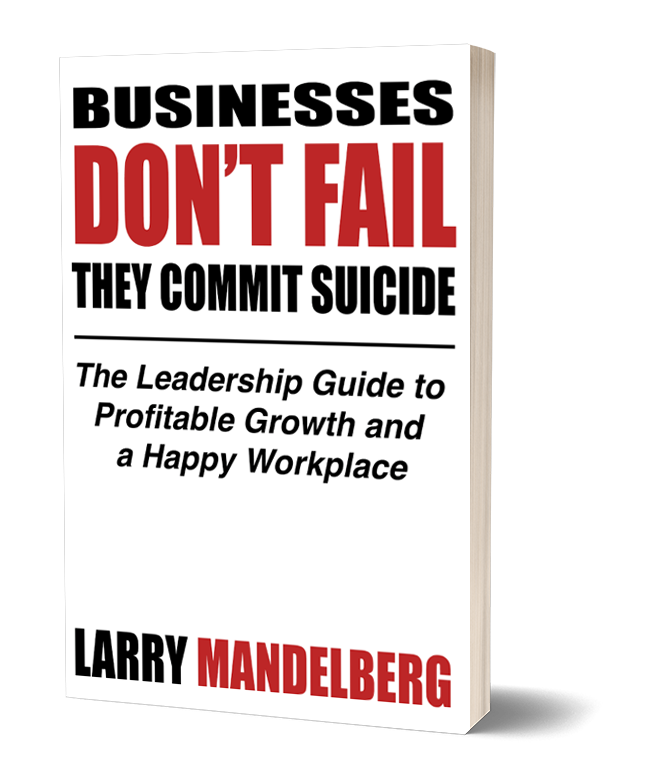 I’ve invested over 40 years studying the dynamics of what makes businesses fail and I know how to help make them succeed. Your business must be able to engage its people. Once we identify where your needs are, I bring my decades of experience and success to your specific situation. Together we will craft and implement solutions that will get your business back on track and growing profitably. Now that you have an idea of how I work with my clients, read a few of the case studies of client projects.